I hope everyone had a wonderful Christmas full of joy and happiness and time spent with family and friends. I know I did! I couldn't wait to do another background paper with the new Wine Tableau set from Sparkle N Sprinkle. I did the Faux Bleach again, this time in all greens. 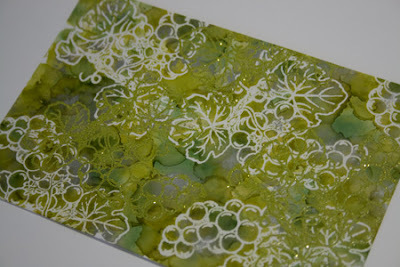 I used Lettuce, Meadow and Silver Adirondack alcohol inks. Then for the embossed images of the Grape Vines I used Pear Star, which was really to subtle and you can't really see it except the glitter that sparkles:) Here is a close up of the background. I stamped the main image with Memento on Neenah cardstock and colored with my Copics. I am really pleased with the way it came out. I added some Green Iris glitter to the grapes and Crystal Lacquer to the moon. 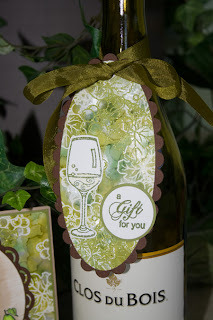 I had a piece of the background paper left so I made another tag for the wine bottle. You can view all the details of the card and tag here. You did a wonderful job on your card and tag. I love the background technique you used for your card! 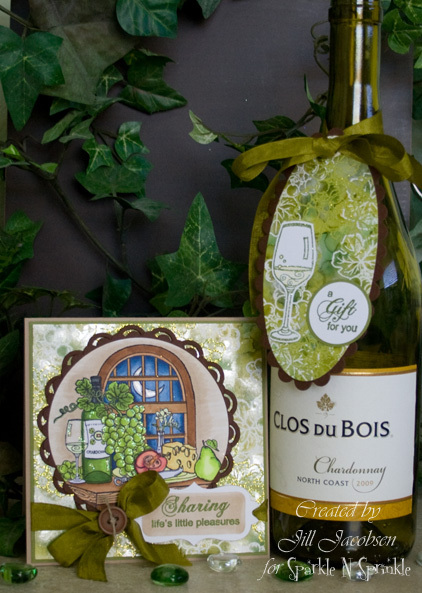 Love the coloring - the colors - the background - feel free to send me the set including the wine LOL. You did a great job on this Jill. Love that background and the coloring is just great! Wow, Jill! This is magnificent! GREAT idea for the background, and beautiful coloring on the image! Very nice project! Jill this is a beutiful card and the coloring is PERFECTION! Love it and thanks for sharing!